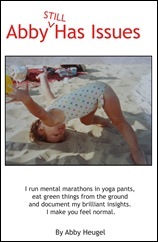 This entry was posted in Uncategorized and tagged Christmas, exercise, gym, holidays, sarcasm, yoga. Bookmark the permalink. Golly. Now I understand why every single muscle in my aging body is so sore by Christmas night. This was great! I especially liked the grocery store ideas, since I seem to spend my entire life there. “Dashing through the snow to bring the trash bin to the end of the driveway before the truck comes in the morning.” This is my husband’s favorite. Sigh. When I read the title of this post, I was like, Wait, who is this? Tell me Abby hasn’t succumbed to the usual stay in shape over the holidays nonsense. I’m so glad to see I was wrong and that you’re back in rare form. You know I wouldn’t do that to you. We’re the only sane fitness people on the Internet you know 😉 PUBLIC BANANA FOR LIFE! 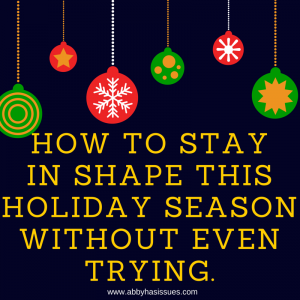 I’d prefer to just redefine what my “shape” is during the holidays. Don’t forget the secret weapon of actually contracting the flu . . .